All members of the Dye Family of architects are iconoclastic in their own way, none more so than Cynthia Dye McGarey. The daughter of Pete’s late brother Roy Dye, Cynthia is not only a rarity in the male-dominated field of course design, but she also happens to be the mother of five. Furthermore, she possesses an eclectic and comprehensive education in a variety of disciplines. From Arizona State, where she studied Horticulture and Landscape Architecture, to Ireland's Rockwell College, where she studied Irish literature and golf, all the way to Harvard, where she earned a diploma in Landscape Architecture and Environmental Analysis. Cynthia has always been on a knowledge quest, seeking to improve her understanding of the natural world, and how to make a difference in beautifying and enhancing it. It's only natural she turned to the 'family business,' and became a course designer herself. 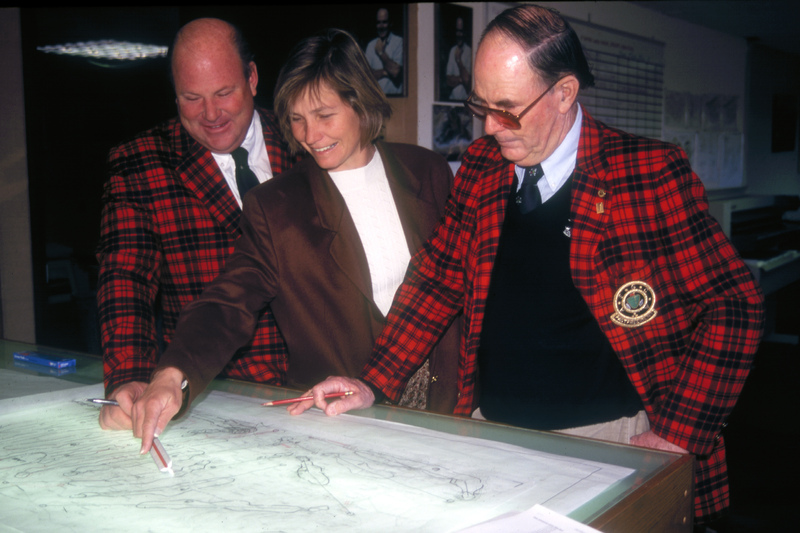 “I enjoyed working on projects far and near with Cynthia," explains her famous Uncle Pete, the only living architect in the World Golf Hall of Fame. "She started with us doing landscaping, and soon developed an insight for design. Alice and I are very proud of her. My late brother Roy was a talented course designer, and his daughter inherited much of the same sensibility. The way her career has evolved has been wonderful to watch." Much like all the Dyes, Cynthia's passport isn't gathering dust in some random desk drawer. Early in her career she spent nearly a dozen years as a design consultant to her father, uncle, cousins and brothers traveling around the world. She developed design and construction expertise in many different climates, terrains and cultures. Austria, Italy, Portugal, China, Japan, South Korea, Thailand, Singapore, Indonesia, Azerbaijan, Mexico and Panama are among the far-flung ports-of-call where she's helped imprint the golf landscape. Stateside she's worked from Hawaii to California, Arizona to Washington, New York, Pennsylvania and Virginia, among others. Three examples of her acumen and accrued knowledge can be found at the new construction of Promontory Golf Club in Park City, Utah, and Whitehorse Golf Club outside of Seattle, Washington, and her sensitive renovation of Nassau Country Club on Long Island. As the lead designer and on-site design construction coordinator at the Pete Dye Canyon Course at the Promontory Club in Park City, Cynthia worked hand-in- hand with Ames Construction company to produce one Utah's best family golf courses. In what has since become a saturated golf market around this highly desirable mountain town, this beautiful and playable golf course continues to win raves from members and visitors alike. Her success in Utah spurred her to form her own operation. In 2002 she formed her own golf course design company, Dye Designs Group. Accolades followed including national recognition when her first solo design, the Whitehorse Golf Club in Washington State, was given the prestigious Top 10 New Courses Award by Golf Digest in 2007. One of the puzzles at Whitehorse was the fact that two watersheds flowed into the property creating nearly seventy acres of strictly regulated wetland. Cynthia worked closely with the local water engineer to route the eighteen holes around the protected wetlands while preserving as much of the native forest as possible. Bio-swales and ponds that are part of almost every golf hole allow the water to slowly percolate through the soil preventing run-off into the wetlands. The major design criteria was building the golf course for three million dollars. The earthworks were kept at a minimum and materials for the greens, tees and bunkers were sourced directly on site. Today it is rated by locals as one of the Best Golf Course for the Value to be played in the Seattle area. Little more than thirty miles from Manhattan, the Nassau Country Club was a century-old gem in need of serious polish. Cynthia renovated all the green surrounds and bunkers on this course that was originally built more than 120 years ago. She completely redid the ninth hole that had been compromised in a previous remodel. After years of failed remodel attempts she opened up the views by removing trees that were suffering from disease and age, while improving the turf and literally shedding new light on the course. By restoring the course to its original character and making the first routing change in 85 years, Nassau was invited to host the 2014 U.S. Women’s Amateur, which was last played there a century prior. Long domiciled in Colorado, Cynthia Dye McGarey continues to create, refine and improve golf courses in many corners of the globe. "It's a creative life, an exciting life, and with the demands of the business and the never-ending whirlwind of the children and grandchildren, there's not too much downtime! But I wouldn't have it any other way."